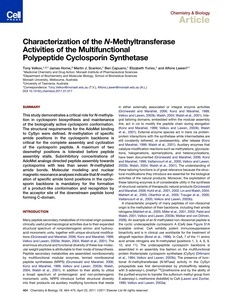 This study demonstrates a critical role for N-methylation in cyclosporin biosynthesis and maintenance of the biologically active cyclosporin conformation. The structural requirements for the AdoMet binding to CySyn were defined. N-methylation of specific amide positions in the cyclosporin backbone is critical for the complete assembly and cyclization of the cyclosporin peptide. A maximum of two desmethyl positions is tolerated before peptide assembly stalls. Subinhibitory concentrations of AdoMet analogs directed peptide assembly towards cyclosporins with less than seven N-methylated amide bonds. Molecular modeling and nuclear magnetic resonance analyses indicate that N-methylation of specific amide bond positions in the cyclosporin backbone is mandatory for the formation of a product-like conformation and recognition by the acceptor site of the downstream peptide bond forming C-domain.